In the fall of 2007 I had the opportunity to tour the Zimmerman home. Because of the close proximity (only a half a block), we also took the time to visit the Kalil home. 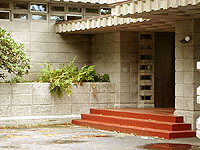 The Zimmerman home, designed in 1950, was completed in 1952. The Kalils were associates and friends of the Zimmermans. There is no doubt that the Zimmerman's new home and their friendship influenced them to contact Wright. On July 1, 1954 the Kalils began their correspondence. Not much has been written about the Kalil Residence. But Michael Komanesky has written a detailed article on "Morton Delson and The Kalil House". Dr. Kalil's parents immigrated to Manchester, an industrial hub at the turn of the century. Toufic was born in Manchester in 1907. He remained in Manchester and opened practice there. He married Mildred in 1940, and fourteen years later contacted Wright. 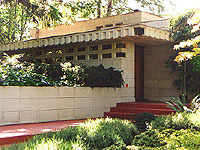 Wright used concrete blocks in many of his homes. But this was only the fourth Usonian Automatic home built using concrete molded blocks. (Adelman S.344, Pieper 349, Tonkens 386, Kalil 387, Turkel 388, Tracy 389 and Pappas 392). 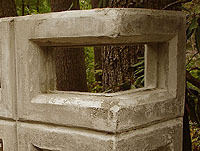 Others were designed using this method, but constructed of standard concrete blocks. If the Kalil home looks similar to the Tracy Residence (S.389), its because the same molds were used in both homes. Not only are the overhead blocks two foot square, but ﻿﻿the home is built on a two foot square grid system, which is consistent with the other homes built of this style. The vertical wall blocks measure one foot by two feet. John Howe drew the presentation drawings. Chris Besinger was responsible for the working drawings. Camillo Palermo and his partner became the general contractors that oversaw construction. John Martineau and Louie LaTullipe worked for Palermo and worked on the home for two years. Morton Delson was Wright's on-site apprentice. To automate production of over twenty different block designs, Dr. Kalil had a machine built that created each block under pressure, allowing the blocks to be removed from their forms immediately enabling the start of the next block. Construction began in 1955 and the home was finished in 1957 at a cost of between $70,000 to $80,000, much higher than the $25,000 to $35,000 that was first estimated. Dr. Kalil passed away in October 1990. Mrs. Kalil had passed away a few years before him. The home was passed on to Dr. Kalil's brother John, who continues to live in the home. There are many classic Wright details. The basic materials are concrete blocks, Philippine mahogany and a Cherokee red poured concrete floor with radiant heat. It is designed on a two foot grid. 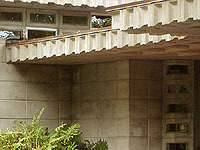 There are rows of perforated concrete blocks with embedded mitered glass corners. There are perforated concrete block windows and clerestory windows with embedded glass. A centrally located sunken fireplace. Clerestory windows bring light into the interior Workspace. The hidden entrance, but this door actually opens inward. And the carport. 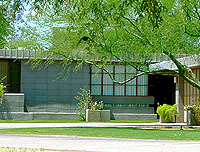 Like many of Wright’s homes, he designed the built-in seating and shelving, many of the fixtures and some of the furniture. The 1,380 square foot home has a living room, kitchen, two bedrooms, two baths and a study. The interior is trimmed and paneled throughout in Philippine mahogany. All of the original furniture, most of which is built-in, still exists. Not only tables and chairs, but also fabric items: the autumn-toned bedspreads, the upholstery, and the 30 throw pillows overlapping each other along the living room couch. There is also an unfinished mother-in-law house on the property. "We worked on this house for over two years." Written by Paul Beaudoin as told to him by his father-in-law John Martineau, January 2007. 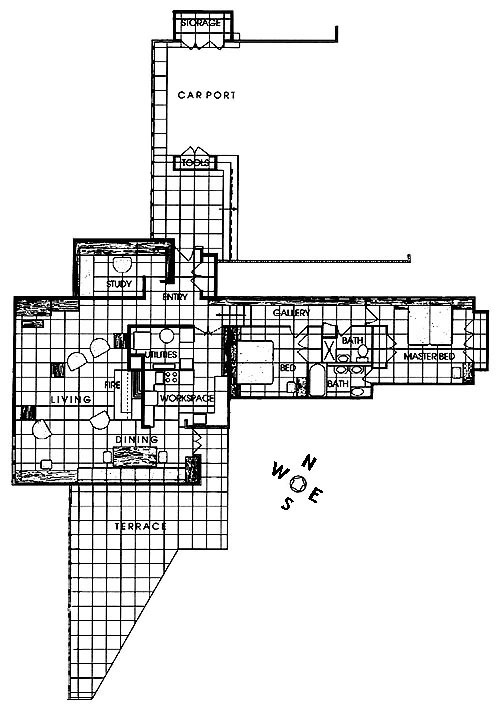 Floor plan copyright 1993, “The Frank Lloyd Wright Companion” Storrer, William Allin, page 415. "Frank Lloyd Wright: In The Realm of Ideas" Pfeiffer, Nordland, 1988, page 72. "GI 10: Global Interior #10: Houses by Frank Lloyd Wright 2" Text: Pfeiffer, Bruce Brooks; Edited and Photographed: Futagawa, Yukio, 1990, pages 164-169. "Frank Lloyd Wright Monograph 1951-1959", Text: Pfeiffer, Bruce Brooks; Edited and Photographed: Futagawa, Yukio, 1990, page 182-183. "Frank Lloyd Wright Selected Houses 8", Pfeiffer, Bruce Brooks, 1991, page 174-183. "Architectural Monographs No 18: Frank Lloyd Wright" Heinz, 1992, page 134. “The Frank Lloyd Wright Companion”, Storrer, William Allin, 1993, page 415. "Frank Lloyd Wright and the Meaning of Material" Patterson, 1994, page 128, 130, 139, 145, 147, 226. "Frank Lloyd Wright" Thomson, 1997, page 146-147. "The Life & Works of Frank Lloyd Wright" Costantino, 1998, page 163, 169. "Frank Lloyd Wright - A Visual Encyclopedia" Thomson, 1999, page 190-191. "The Vision of Frank Lloyd Wright" Heinz, 2000, page 248, 251. "Frank Lloyd Wright Field Guide" Clayton, 2002, page 290-291, 468. "Frank Lloyd Wright American Master", Weintraub; Smith, 2009, pages 328-329. "Frank Lloyd Wright, Complete Works 1943-1959", Pfeiffer; Gossel, 2009, pages 406-407. "Journal of the Taliesin Fellows" Komanecky, 1992, page 4-13. "The Wright neighborhood" Donelan & Forester, 2005. "My Story of Building Dr. Kalil’s House in Manchester, NH", Beaudoin & Martineau, 2007.